James Cowie often described as 'an artist's artist', produced what are generally regarded as his finest works during his years of teaching at Bellshill Academy. His drawing skills, perceptive sketches and portraits of school pupils and his distinctive still lifes remain memorable and are an important influence on the thinking and method of approach of many present-day artists. Yet little has been recorded of his immediate influence on his pupils of that time. One notable exception, however, is Robert Thompson, the son of a local iron worker, who attended Bellshill Academy and was taught by Cowie from 1930-33. From the start the connection between Cowie and Thompson was sympathetic and productive. 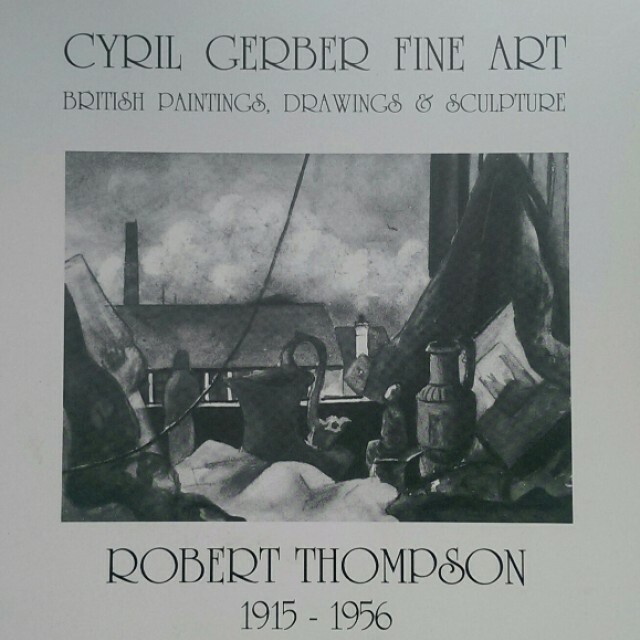 In a catalogue note for a recent exhibition in Bellshill Academy of Thompson's work his daughter describes the 'wonderful example of a working relationship between a talented boy and an older artist beginning to find his own language. Cowie, on seeing the fifteen year old Thompson's pencil drawing "Head of a Bellshill Boy" must have felt the shock in recognising in another, however young, the same drive for the complete realisation of an idea'. Cowie, was using figure drawing and still life, combining his teaching with his own work to express his poetic feelings about life. The similarly complex arrangements he set up for his pupils incorporated classical casts and fragments, postcards and geometric forms, superimposed and merging landscapes with distant and foreshortened perspectives. These must have been extremely challenging for such young pupils, but as can be seen from the exhibition Robert Thompson coped with them with extraordinary skill and feeling and tonal control. Thompson used his understanding of such ideas of Cowie's to develop and enrich his own work. Cowie, recognising the ability of his pupil, gave him extra tuition and persuaded his parents to send him to Art College. He attended Glasgow and Edinburgh Colleges where he won the Andrew Grant Travelling Scholarship. Working in this new environment and travelling abroad, 'exposed' Thompson to many different artistic values. It was a time of exploration and intellectual expansion for him. Under Cowie's guidance, Thompson had produced many excellent drawings of still lifes, and composite subjects and numerous accomplished portraits, including at least one of Cowie, who also drew Thompson. However, now his drawing technique began to loosen, the work became more spontaneous and Cowie's influence gradually lessened. But, before his work could develop further it was interrupted by the outbreak of war in 1939 and Thompson spent the next 5 years in the RAF as a Radio Operator and tutor in Art History. He also managed to do some portraiture and stage set design and some acting which particularly helped to relieve his frustration. After the war ended, Thompson, now married with children, was teaching in schools in Glasgow. Cowie had gone north to Aberdeen to become Head of Painting at Grays School of Art, and later Warden at Hospitalfield Art College, where Joan Eardley was a post-graduate student. In 1953, Thompson became Head Art Teacher at Castle Douglas High School where he worked for the next few years. The family moved to Crossmichael and at that time the subject matter of his work changed. It has been suggested that he may have felt his art could now only progress in closer harmony with nature. But his development was again interrupted tragically. Thompson was stricken with cancer and died at the age of 41, coincidentally in the same year as Cowie's death in 1956. Fortunately due to the interest and affection of his daughters, Thompson's work has been preserved.